Afternoon everyone! 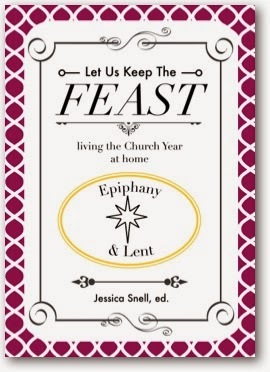 Fresh on the heels of Candlemas, I thought today was a perfect day to review the next book in the Let Us Keep the Feast series, Epiphany & Lent (series edited by Jessica Snell). I reviewed the first book, Advent & Christmas, back in December, and some foundational information about the series can be found in that post (so go read it if you haven't already, quick like a bunny. ;-)). In a nutshell, these are small but wonderful little books that discuss a particular portion of the liturgical year from a Christian perspective (this includes Catholic as well as some Protestant traditions). Included in each is a history of the liturgical season, any special feasts therein, associated traditions and suggestions for old and new ways to engage in these, recipe and craft ideas, and ways to celebrate the season out in the larger community. There are always some really good suggestions that I would not have thought of on my own. And so this Epiphany & Lent volume was really interesting to me because I learned some things about other Christian traditions. In the Catholic Church, Epiphany is fixed on the calendar at January 6th, but celebrated in Mass on the Sunday following that. The subsequent Sunday will be the feast of the Baptism of Our Lord and formally begins a sliver of Ordinary Time leading up to Lent. In other churches, Epiphany is a full liturgical season celebrated up until Ash Wednesday. The librarian learned a new liturgical tidbit, and she likes this very much! Of course, the traditions and suggested activities apply regardless of how long one celebrates Epiphany, and are beautiful things to reflect on leading up to Lent. In the Epiphany segment of this book, the author addresses Twelfth Night traditions, a blessing of homes, gift giving during this season, and Shrove Tuesday. In the "New Traditions" section, she includes some suggestions with a theme of Christ as the Light of the World that I thought were lovely and inspiring. And there is a recipe for King Cake! Who of you are very ambitious bakers out there?! *cups hands over eyes to scan the crowd* I also really enjoyed reading about a traditional home blessing during Epiphany. Some nice ideas in this section for including your children in this activity. In the Lent portion of the book, I once again found very good suggestions that I have not have done before. Fasting from something other than food, for instance, making your Lenten world less "noisy." Incorporating spring cleaning, which I LOVED. They can be little things, but when done with great love we can transform both them and ourselves. A very. St. Therese of Lisieux interpretation of Lent. :) There are some nice suggestions for your children, including creating a child-friendly daily devotional time, and allowing them to choose for themselves something meaningful to give up until Easter. Suggestions very dear to my heart were to craft and give those items away during Lent, and to keep a reflection journal. Once again, I was impressed with this series. I am pleased to be compiling a print copy of every volume in the set, and have already given a few away as gifts. You can buy these books at the Doulos Resources eStore in either print or ebook form. Use the discount code “LUKTFBlogTour” to receive 15% off your order! I am, though, also giving away a copy, *insert happy noise*! Enter below with Rafflecopter. I will announce the winner Friday morning! Love the look of this book. We try to live the liturgical year but didn't as a child so need help. i would love to have a chance to win this! This sounds like a great book. 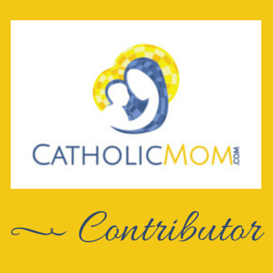 So nice to have found your blog! I'm entering. Maybe I can use the suggestions with my niece & nephews (particularly as two of them are preparing for First Holy Communion! ).